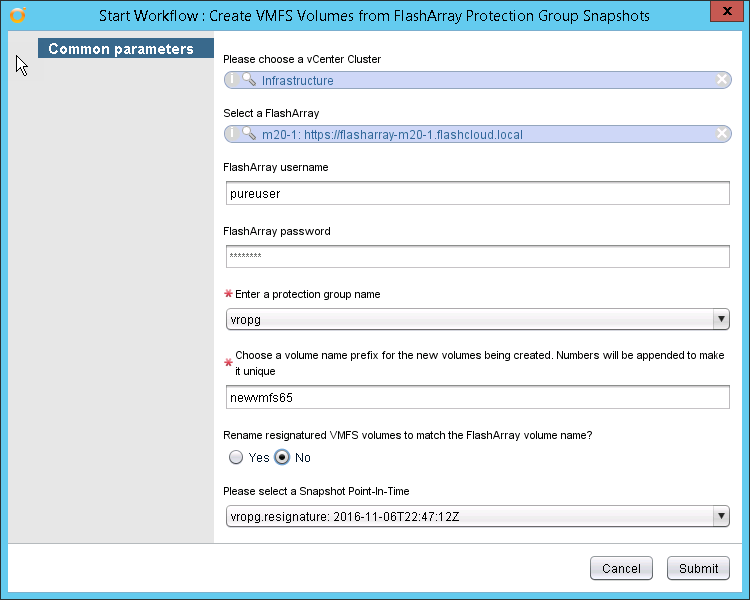 One of the new features from a core storage perspective is a new version of VMFS. In vSphere 6.5, VMware has released VMFS 6, the first major update of VMFS in year (VMFS 5 in 2011). 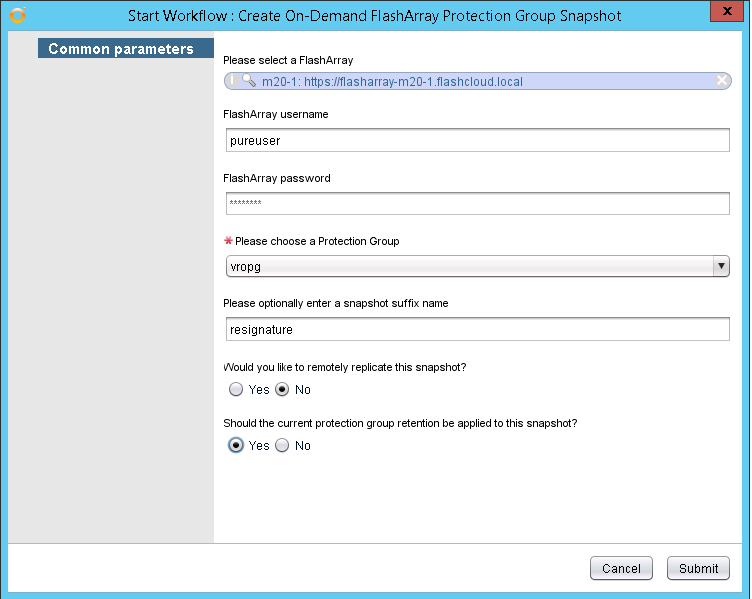 Not earth shattering changes, a lot of pain points have been removed and there has been A LOT of work put into VMFS 6 to improve concurrency of operations and speed up certain procedures. The first thing I want to mention is unresolved volume handling. Unresolved volume handling has always been a little frustrating. The presence of unresolved VMFS volumes slowed a lot of things down, such as listing new volumes in the create new datastore wizard. 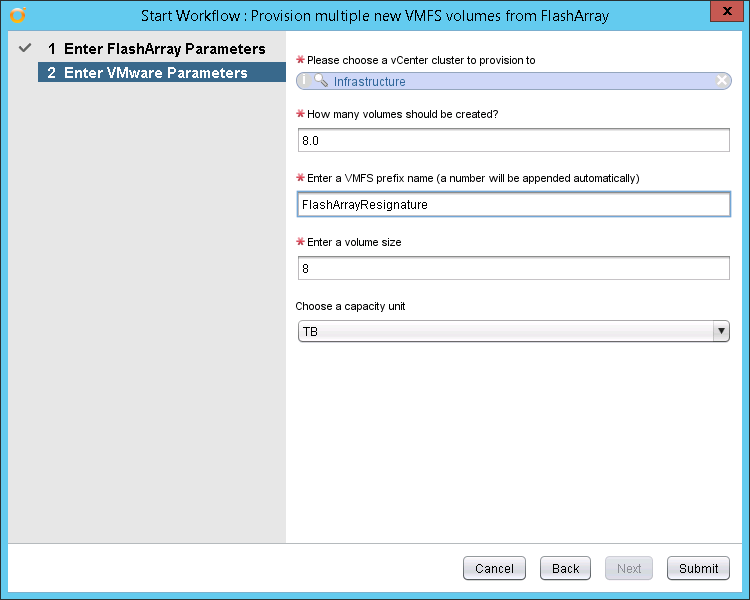 One of the many improvements they made in VMFS was around parallelism of access and dealing with VMFS-wide metadata changes. This has led to, among other things, a rather significant decrease in duration of resignature-related operations. Additional reading about what an unresolved VMFS is. The first example of this is simply listing available unresolved volumes. The time it takes to do this is directly correlated with the number of unsolved volumes present. This affects not only this command, but also anything that issues that command, like the add new datastore wizard. 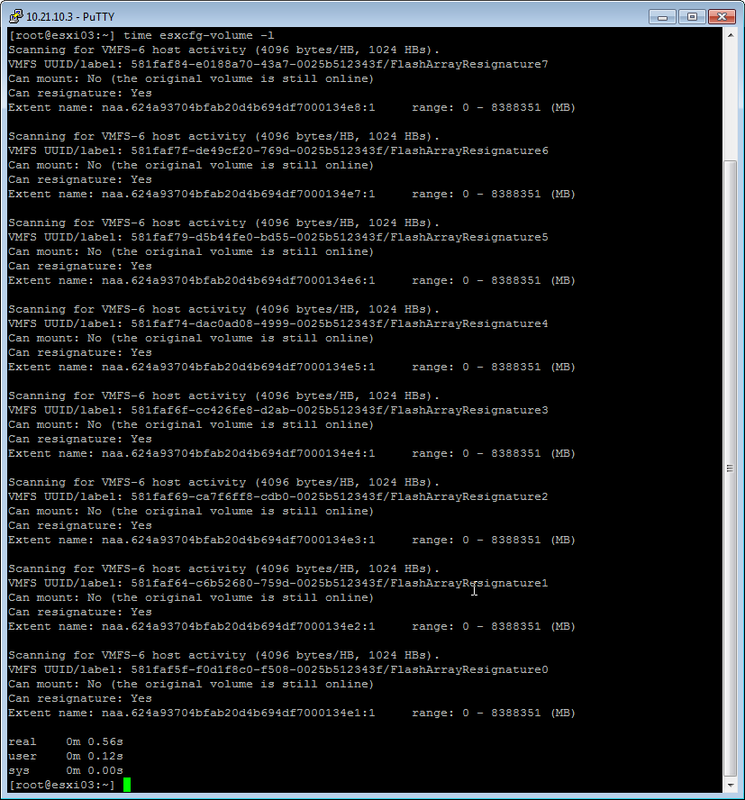 The ESXCFG-VOLUMES –l command shows unresolved VMFS extents. 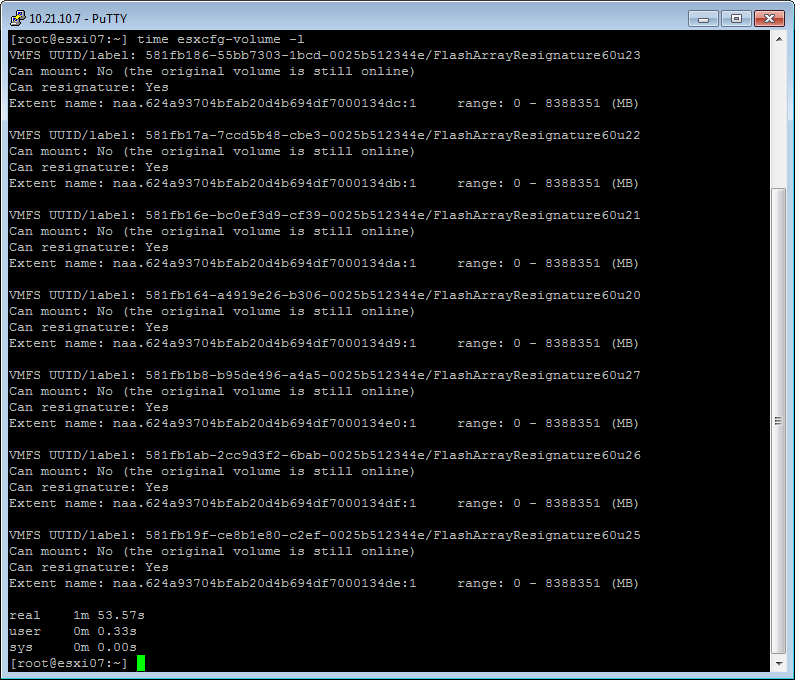 This is analogous to the SDK method queryUnresolvedVmfsVolume(). With ESXi 6.5 and VMFS 6, it takes less than a second. Much faster! So what about actually resignaturing? Well I ran a test with snapshotting 8 VMFS volumes and then presenting those copies back to an ESXi host and then resignaturing all of them at once, using the SDK method resolveMultipleUnresolvedVmfsVolumesEx_Task. This allows you to pass an array of unresolved volumes at once. To do this, I used my vRO workflow package, since I already had a workflow built that uses that SDK call. Of course you can use PowerCLI or whatever else. When I did this with VMFS 5, it took 19 minutes, 43 seconds. Ugh. With VMFS 6, it took 15 seconds! Much faster. So there is another great change in vSphere 6.5! I see quite a bit of our customers cranking out a lot of VMFS copies daily, so this will be very helpful. Many more blogs to come! I just installed ESXi 6.5 on a 10GB Pure boot LUN, and was surprised to see that the VMFS version is 5.81. In comparison, on a 10GB NetApp boot LUN, the VMFS version is 6.81. What gives? Also worth noting is that on a NetApp 8GB boot LUN, ESXi 6.5 would not install, but works ok on 10GB. Minimum size for boot from FC is supposed to be 5.2GB. I have cases open with both VMware and NetApp, and so far it’s been a finger-pointing game. Interesting. Let me look into it and get back to you.